This is the first post on the Sufferin’ Summits preview. But first, a little philosophy about the route. I’ve tried to make the route as hard as possible, which means lots of elevation gain and as much steepness as I can find, but I’ve also worked hard to keep it as short as possible. Those two are obviously in tension; I could easily add a very painful 2000’ more of climbing, but I’m happy with the overall distance as it is. I have also tried to make the route flow. That means limiting the number of “up and down the same road” sections, and not climbing up the same section of road more than once. And finally, I’ve tried to make it worthwhile. That means climbing to places where there’s a nice view. If you are purely interesting in elevation, I recommend the Zoo Hill Century instead. I’ve done the Highlands climb up from Issaquah a number of times, first on the Eastside Tours Ride that Per Sunde used to lead (and now I lead), and then on my own. I never really liked the climb very much; the bike path is fine but not really very pretty, but it is a decent way to get up onto the plateau. Then, a couple of years ago, I decided to climb up into Grand Ridge. My first ascent was up the main street – Park Drive – and was a bit of a slog, though if you go all the way to the top, it’s worth it. Then I found a nice way to skip the busy part of the development, with a no-cars section off of Black Nugget road, and now I like the trip much better. It does not have the pure challenge of some of the later climbs, but it has some cool houses to look at (watch for the castle on the right side near the top), a very nice view, and a couple of fast descents. This year, I’ve settled on a new route. It’s simpler, avoids some construction, and includes something special that the existing route did not. Here’s a picture of the route, click on it to see it in RideWithGPS.com. Clocks in at 1061’ of up. This is not, in fact, the hardest route up this particular hill. We start on the bike path near I-90, climb into the highlands and then work our way into a neighborhood and then a special surprise at about the 4 mile mark. The upper part is the same as previous years, but is less confusing. At the top of Grand Ridge there is a short bit of driveway that you can climb if you’d like an extra 30’ of elevation gain. The descent through the development is nice, and then the descent down Highlands is a bit of a screamer and the pavement isn’t perfect, so I recommend paying some extra attention. We end up back in Issaquah heading west on Sunset. I will leave you in suspense, eagerly awaiting the next hill, assuming that you haven’t followed Sunset drive to the west and seen the exceedingly obvious climb #2. Here’s the gradient view. Due to inaccuracies in the elevation data, it’s not very good; the start of the climb at the bottom is more in the 12%, and there is not a 20% kicker near the top. This last Friday I got on a plane at Sea Tac to head down to Maker Faire 2015. I’ve been to a couple of mini Maker Faires in Seattle, and thought it would be a fun way to spend a weekend. Just a bit of level-setting to start. I’ve been building and working on stuff since I was very young. Doing building stuff with my father, changing a clutch in my car, building a set of bunk beds for my college dorm, a couple of decks on my current house, all the finish work on a ski cabin with my wife, a custom cabinet for my AV gear. Most of this stuff is custom; I or we come up with a design and build it from scratch. Plus, I have a long history of building custom animated holiday light displays. So… my comments are from the perspective of somebody who has been a Maker since long before the term was invented. Because I didn’t decide early, I couldn’t get into any of the Faire hotels, so I decided to stay north at the Hampton Inn about a mile from the Colma bart station. As long as you can fit what you need into a backpack, this works okay; Bart runs right to the airport and is easy to deal with. On Saturday, I rode BART to the end of the line (Millebreu? ), and took a school bus shuttle to the faire where we waited to open. 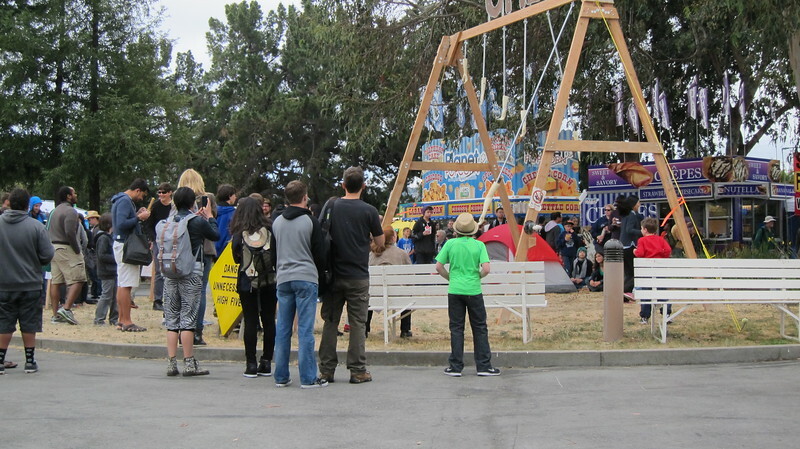 The fair is divided into a bunch of different zones, indoors and outdoors, so it’s pretty easy to wander around. Hard to find stuff, however, and hard to track what you’ve seen, especially in the mostly dark LED building. Ply 90, an aluminum corner that you use to build boxes and cabinets out of flat plywood panels. Great if you don’t want to do wood joints. 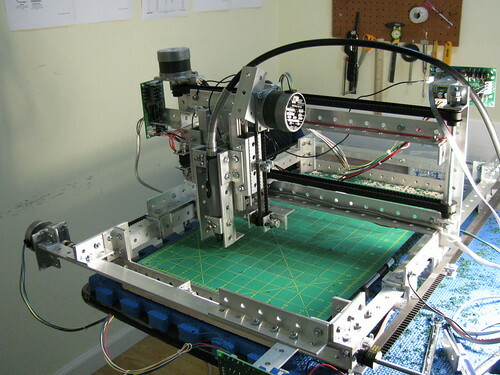 Contraptor, an open source hardware (in the “metal” sense). 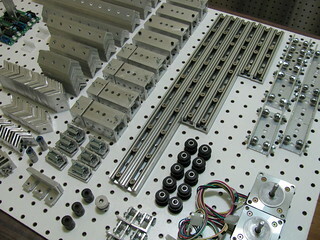 CNC Router parts. These guys had two CNCs plus a plasma cutter running. 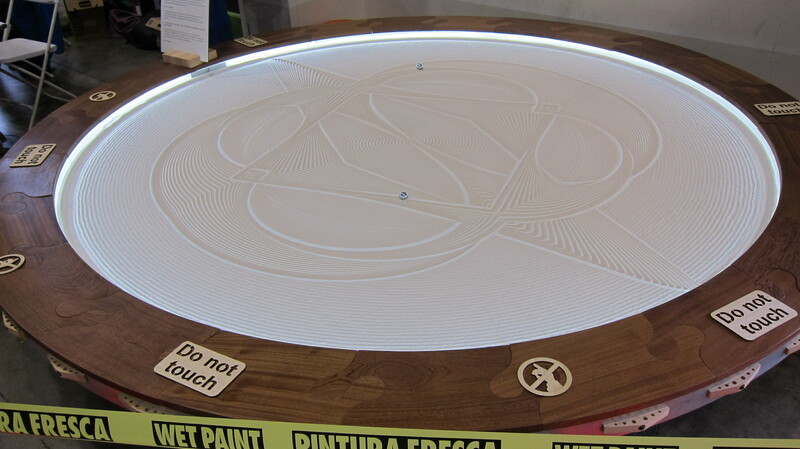 The palette, a multi-filament joiner to print in multiple colors with a single extruder. 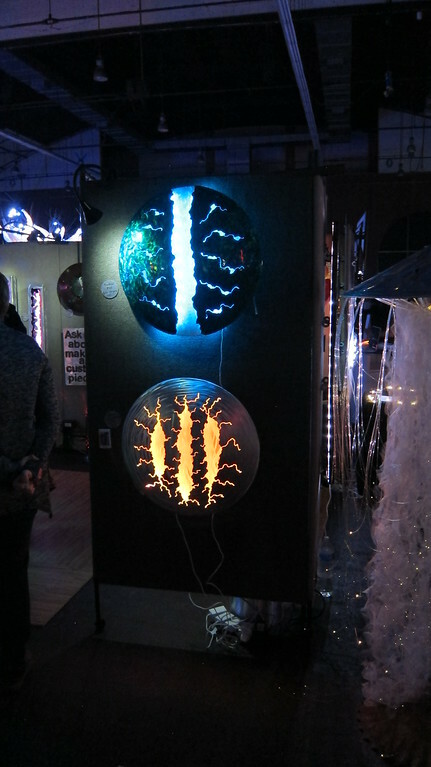 Kristen Hoard’s LED-lit art. Plasma cut aluminum, some of it with enamel on it, lit by color-changing LEDs on the inside. Really nice. The Unnecessarily High 5. A huge crowd favorite. Full gallery with some videos here. It was really nice to see so much Maker stuff packed into one space, and I thought Make – the business entity – did a decent job of putting their commercial stuff – Maker Shed – in one building, and a lot of people were happy to be able to buy stuff there. I liked wandering around and looking at the different stuff going on; the power wheels racing, the cycle-cyde (lots of bikes modified in ways that make them hard to ride), and the bike movable things that look like they were from Burning Man. I also think they did a good job at trying to get people trying new things – learn to solder, learn to do a bunch of others stuff – and there were kids all over the place. 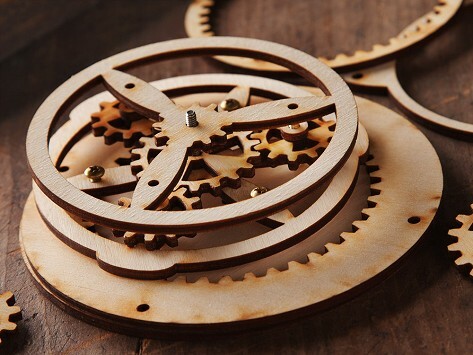 But – as an experienced maker – I didn’t get a ton out of it from an idea or technical perspective. A lack of ideas has never been one of my problems, and I am probably an outlier in this perspective. I’ll should preface this list by saying that, as a Windows Phone owner, I could run the IOS/Android app, and maybe that would help. But there are still a lot of people out there without smart phones. Trying to figure out what talks there were that I might want to see was an exercise in frustration. The website lists each of the stages separately, and the only thing you can do is read each of them and write the time and topics down and then try to get back to them. This is a solved problem; just do what the big tech conferences do. No guide where presenters were located, so that I could go try to find a specific company or figure out who was at a booth by location. I went to the “Maker pro” talk, which was a very interesting topic for me – what do you need to do to quit your day job, and how do you decide to jump? We had two people who had done it, but didn’t really get the chance to tell their stories. Yobie Benjamin had a talk that looked really interesting to me, but was mostly targetted for people who want to do a kickstarter at the $1M level. Many people really want to do something much smaller, and a lot of his advice didn’t make sense for the rest of us. “Epic Fails” was billed as an interesting talk, but wasn’t about the real topic at all. The three presenters were fine, though their perspective was mostly about woodworking and youtube. Call the talk something different, and get more diversity in the group. It would be great to have “birds of a feather” sessions if space could be found.